Cast Shadows features remnants relating to the fleeting event that is an iron pour. The process of casting iron is a transitory event that leaves residue in different ways. The end products of an iron pour are not exclusively cast iron, but may exist in video, photo, t-shirts, storytelling, blogs, and other media and memorials. Artists who utilize cast iron produce “permanent” products in iron not only as work unto itself, but also as document to the event. The iron casting process is connected to a long history of metal art, industry, and human history. Cast iron artworks are in a sense living in the shadows cast by this rich past. At the same time, contemporary artists are casting their own shadows onto those around them and into to the future. A community retains the ethos of casting metal. Having an iron pour is a very active process. A considerable amount of planning and preparations is required for such an event. Materials need to be collected, a furnace may need to be built, repaired and set up, molds need to be made, iron and coke cracked and sorted, people informed as well as taught. During the event, all individuals must be very aware of their surroundings and pay attention to the materials, the machinery, and the physical and mental conditions of all. The featured work "alive with you" by Juliana Pivato was selected for the t-shirt of this show and the accompanying iron pour. The statement of the title suggests the state of awareness that is necessary for a successful casting event. Respect is necessary to be safe and to enjoy the community of this art form. The theme of the show Cast Shadows relates to the legacy of information. Every time iron is cast, the processes and spirit of those from whom we have inherited it (whether in industry, agriculture, metallurgy, armament, craft or art) are called into being. We are alive with them. 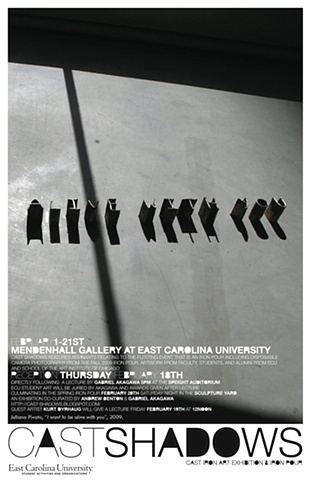 This art exhibition contains works selected by Chicago-based artist/curator Gabriel Akagawa and ECU graduate student/co-curator Andrew Denton from the East Carolina University community of art students and alumni as well as other selected artists from outside that community. There is a digital relationship between the curators from Illinois and North Carolina. There is a line like a cast shadow from a sundial that goes back and forth between Denton and Akagawa, two gnomon.